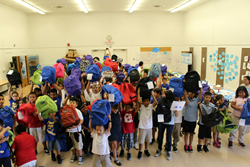 The Dream Builders Project, a Los Angeles based nonprofit organization, is partnering with after school program, After-School All-Stars, and other organizations to supply more than 300 students with new school supplies. Giving back to the young generations is our investment in the future. The Dream Builders Project, a Los Angeles-based nonprofit, is hosting a Back to School Supply Drive with After-School All-Stars for their signature Back to School Event. Benefitting students at Griffith Middle School and the surrounding east Los Angeles area, The Dream Builders Project along with Image First, WorldVision, and AvalonBay Communities will supply more than 300 students with new backpacks filled with a variety of school supplies, including folders, notebooks, writing utensils, mathematical equipment, as well as other educational necessities.